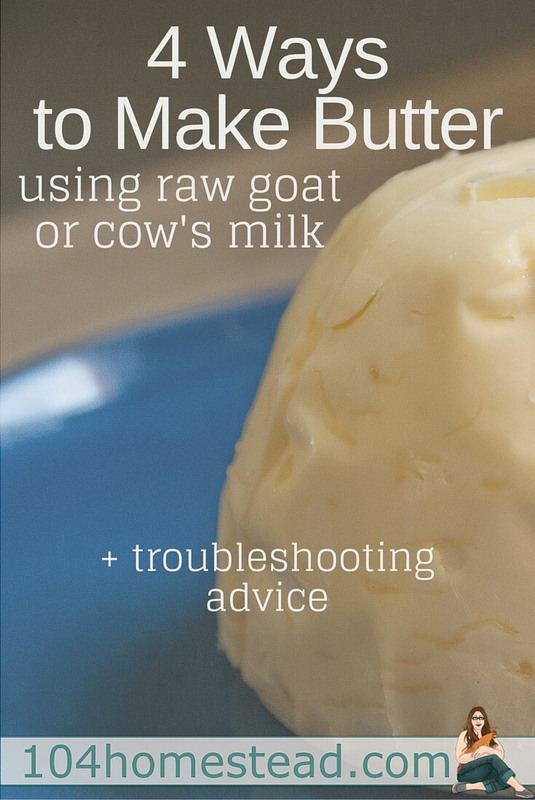 With or without a goat or cow, you can make your own butter from raw milk. While homemade butter made from store-bought raw milk may only save you about 7¢ a stick, butter made from raw milk that came from your own animals can save you, well, 100%. If you are getting raw cow’s milk right from your own cow (or a friend’s cow) than separating the cream is easy-peasy. Chill your milk in the back of the fridge. After a couple of days you will see the cream layer floating at the top. Just skim off the cream and the skim milk (see where the term comes from) will be left behind. Store bought raw cow’s milk can be a bit trickier, especially if you live in the US for some reason. The best way I’ve found it to pour the milk into a glass container with a spigot (like those lemonade canisters). Again, put your milk in the back of the refrigerator for a few days until there is a clear line between the milk and cream. Using the spigot, pour out the milk which will leave the cream behind. Goat’s milk can be really tricky to separate. Most people will suggest a separator to you and I’m going to be another one of those people. I’m not going to lie, they are pricey, but if you have goats and you want to make butter or coffee cream regularly, it’s worth the investment. If you don’t want to drop that kind of money, it can be done manually with a bit of patience. Pour one gallon of milk into a large shallow pan and leave it in the refrigerator for 24 hours, then carefully skim off the cream. You may need to do several batches to get enough cream for making butter, but the taste is worth it. Did you know many people still make butter with a churn? Seriously, they do. Granted I’m not one of those people. Churns have come a long way and now are small enough to sit right on your counter top. They now involve a crank that attaches to a glass container (they have them on Amazon). They are still a bit of a workout, but the butter is the best texture when made with a crank. Here’s a great video showing you the process. Simple pour the cream in the jar leaving a good amount of head space, put the lid on firmly, and shake vigorously for… (no joke)… 35-40 minutes. Yeah, you can skip the gym on butter making days. You’ll see the butter go through various stages before it separates. Keep shaking until you’ve got obvious butter and buttermilk. Once separated, strain and rinse (see tips below straining & rinsing). A food processor makes faster work of what the mason jar does, but it saves your arms from a lot of aching. Fill the food processor half full of cream. The size of the processor will dictate how much butter you can make in a batch. Run your food processor on medium-low until you begin to see clumps forming on the surface. Lower the speed to low until you have obvious butter and buttermilk. Strain and rinse just like you would with jelly jar butter. This is the way I prefer to make butter. Just me and my trusty KitchenAid (I have cobalt blue myself). 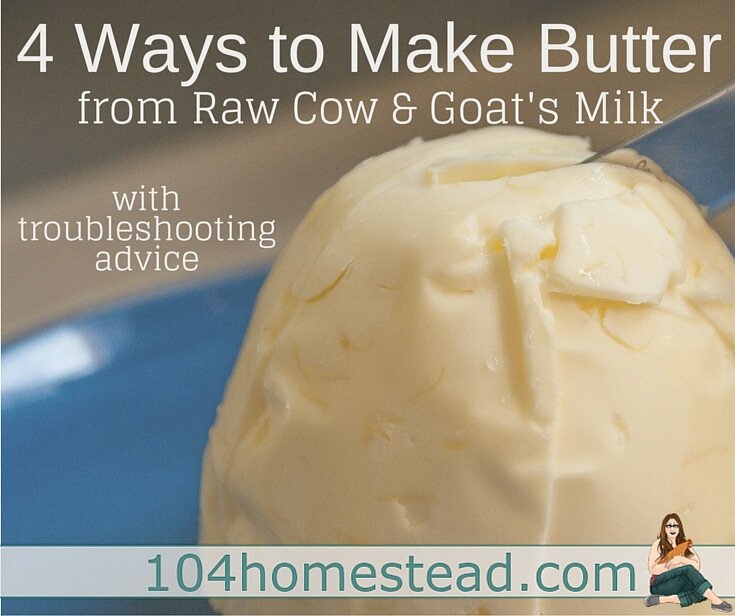 Making butter in a stand mixer is a bit different than the other methods. Instead of cold cream, you want your cream close to room temperature. I typically pull my cream from the fridge half an hour before I make the butter. At the same time I pull out the cream, I put my KitchenAid bowl in the fridge so it can get nice and cold. When the time has come, pour your cream into the cold mixer bowl. Starting on setting 1 with the wire whisk attachment, begin to mix the cream. Slowly work your way up to setting 10 (you will want the splash guard and maybe a hand towel to control splatter). After about 3 minutes you will see the butter forming. Once the butter begins to stick to the whisk you are ready to strain and rinse. Using cheesecloth or a fine mesh strainer, strain out the buttermilk. Make sure you save it because there are a lot of great recipes that use buttermilk. Return your butter to whatever vessel you were making it in (jar, processor, mixer). Add as much ice water to the butter as you removed of buttermilk. If you are using a jar, shake the jar for 3-5 minutes. If you are using a food processor or stand mixer, run on a low speed for a minute or two. Strain and discard the liquid. Repeat a second time. If the water comes out clean, you can proceed. Otherwise repeat a third time. Once your butter is clean, put your butter in cheesecloth and squeeze all the liquid out. If you want salted butter (or to add some herbs), now it the time to knead it in. 1/2 teaspoon per pound of butter. At this point you can store your butter in a little dish or you can mold your butter so it looks pretty (I don’t have time for that, but maybe for special occasions). Sour or “off” taste? Sounds like your raw milk wasn’t super fresh when you started. Yes, you need to let the milk sit for a bit in order to collect the cream, but allowing it to sit for too long means it might go sour. Waxy textured butter? Don’t over knead your butter in the final stages. You need to make sure to wash all the buttermilk out, but too much kneading leads to a weird texture that may be edible, but not too appealing. Overworked butter may not melt and no one likes that. Sweaty butter? Don’t worry, that’s not as gross as it sounds. Sweaty butter is butter that has moisture that develops on the surface. This happens frequently with unsalted butter, but it can happen if you don’t incorporate the salt well. Make sure all buttermilk is rinsed and knead well to mix in the salt. What cream separator do you use? Thanks for the butter info. I’ve had success in my stand mixer. I have a question about drinking raw cows milk. Does it need to be pasteurized and if so do you have any tips? Thanks. How do you by hands wash and clean the bowls and whatnots that butter was contained in without making more mess? It’s fun and rewarding to make my own butter, yet cleaning the greasy bowls is a very time consuming nightmare. So helpful to know about having room temp cream and cold mixing implements! 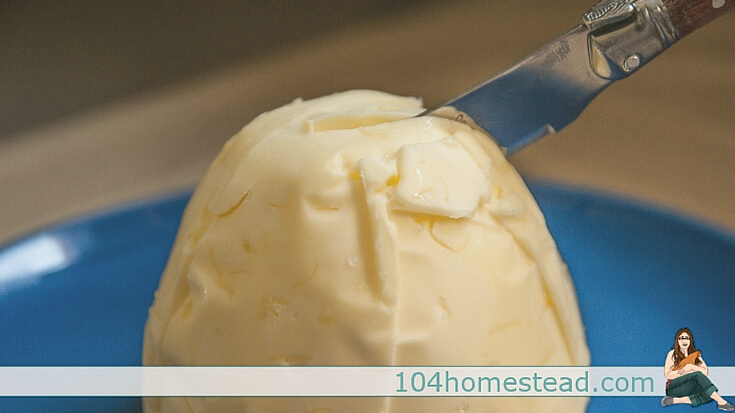 I have been making my own butter, but lately it hasn’t been going as well… the trouble shooting tips really helped! after taking the cream of the milk for the butter how can I use left over milk? It makes the milk “skim” so you can still use it as milk. I’m not a huge fan of drinking skim milk, so I tend to save it for cooking instead. That is so good to hear about the cream separators: that they work. My girls have cream but by the time it separates it isn’t fresh and doesn’t make good butter. Your separator works with your goat milk? Yes, and well worth the investment. Thank you for sharing I just found an old mason jar churn at an attic shop I’m excited to try it grew up on homemade cows butter which I used cream if I can’t get access to fresh milk? That is good to hear about buying a cream separator: that it’s worth the investment. I want to very badly! My girls have cream but by the time it separates it’s not fresh and doesn’t make good butter. A separator works well with your goat milk then? I have a question on making butter using raw milk. I use my vitamax blender but For some reason my cream just never separated even after 10-15 min of running the blender. Can you help identifying the problem. I haven’t tried using a Vitamax (mostly because owning a Vitamax is still on my Christmas list), but my thought is that there is too much milk in the cream. Is it goat or cow milk that you’re using? Vitimix heats contents due to high friction after a few minutes. That’s why it didn’t separate. I tried it in mine too. Stand mixer or food processor worked much better. Only problem I had was not rinsing properly. .. my butter smelled like cheese… but tasted great!